The biggest question app developers are facing today is how to get paid for their apps and content. In particular they face two challenges: how to make purchasing on mobile easy enough so that people will buy their app and in-app content, and how to enable people to make payments in markets where many do not have credit cards. One answer is carrier billing. 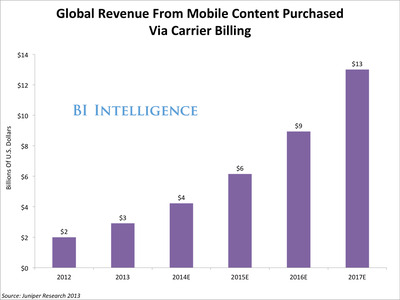 Carrier billing allows people to buy digital content by adding the cost of a purchase directly to their mobile bill. It’s similar to buying on-demand television by adding it to your cable bill. The idea is not new and, in fact, carrier billing was the first method available to consumers for buying things like ring tones and wallpapers before the advent of smartphones. 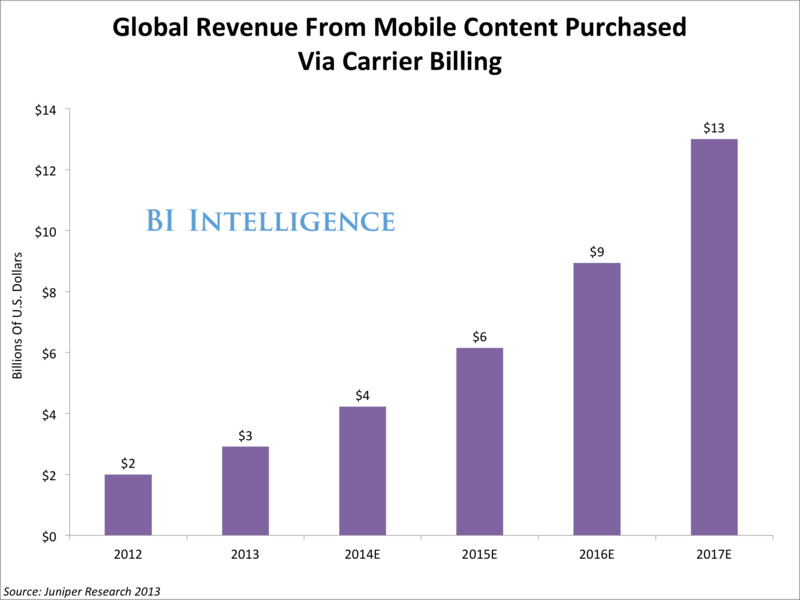 But now a new report from BI Intelligence finds that carrier billing is being updated for the mobile app age. While the concept of adding charges to one’s mobile bill hasn’t changed, carrier billing technology has made some giant leaps and now offers a smooth, low-friction way for consumers to pay for digital content like apps and tokens within apps. That’s why it has developers, app stores and mobile carriers so excited. But that said, it faces some major hurdles, in particular the high prices currently charged by mobile operators for providing carrier billing services has kept many app developers away. In the report, BI Intelligence explains how carrier billing works, who is using it, and whether or not it has the potential to catch on for physical goods, beyond the world of digital content. Though it’s often associated with emerging markets, carrier billing companies actually make most of their money in developed markets like North America and Europe. But that could change. In emerging markets like India, where mobile penetration is high, but hundreds of millions of people lack credit cards or bank accounts, carrier billing has especially big potential as a way to get more people paying for apps, music, and in-app purchases on mobile devices. In terms of numbers, we estimate carrier billing powers $US3 billion in mobile transactions, or 12% of the global market for mobile digital content. Mobile operators charge fees between 25% and 40% of the total cost of purchased goods. But as carriers struggle to maintain revenue, and realise they are missing out on a big opportunity in digital goods, they are beginning to compromise on their rates in hopes that they will see a higher volume of carrier billing sales. The holy grail for carrier billing is to reduce rates enough so that people adopt it as a method for purchasing physical goods via e-commerce sites and apps. If this happens, as it has in South Korea, the carrier billing opportunity would be truly massive, as it would begin to compete head to head with credit cards as a payment method. Explains the complex set of relationships between wireless carriers, app stores, platform vendors, and app developers, upon which carrier billing depends. Includes interviews with executives from four leading carrier billing companies on challenges they are encountering in their market and the health of the industry as a whole. Assesses just how big the carrier billing opportunity is, where it has the most potential for growth, and the hurdles it will have to overcome in order to expand to be a commonly used method of payment among consumers. Analyses how and why carriers are beginning to lower their once-prohibitive fees for powering carrier billing transactions.